For our workshop reaches the turbocharger or courier brings her client. After receiving it, followed by a preliminary reading of the turbo model and serial number, which is important for the created order at this stage of regeneration. Faulty turbocharger along with the order goes to the so-called. Special room, during which the process of dismantling and cleaning the turbo parts. Is a proven serial number and model turbines on order and turbocharger. Then, a punch is made marks on the body of the intake and exhaust across the opening of the oil supply. The vacuum valve is installed and then tested using a vacuum hand pump. If the valve is operated smoothly and correctly it means that it is suitable for reuse. The turbocharger is mounted in a vise, where adequately protected employee (goggles and gloves) hits a punch screws to the core portion of the exhaust turbocharger to move these screws (sometimes hard baked). The screws are screwed out and then turbocharger is removed from the vise on the table, where there is a dismounted turbine. If it is a turbocharger with variable geometry that the outlet body is returned to the vice in order to disassemble the variable geometry. Fixing screws variable geometry is boosted with the plunger to facilitate their undoing. If successful, the screws of variable geometry should remove. Unfortunately, it often happens that there is a rupture, which is needed in extreme cases, interference drill and then tapping. Then, it dismantled the entire variable geometry, by the way blades are checked for damage. Now vice goes to the core of the turbocharger has not split housing inlet. They are unscrewed screws that secure the two elements together. Is separated from the core body intake and then checked the surface of the body at the point where the rotor. All features disqualify part. On the vise is the very core of the team and the rotating bearing. Detachable is now wheel nuts compression to the main shaft. It should be remembered that the majority of turbochargers has a left-hand thread, thus unscrew the nut clockwise or counterclockwise. Circle compression may need to be heated using a heat gun because of a tight fit. Heat the center of the rotor at 45 ? C for approx. 15 seconds. Removed the rotor passes the technical evaluation of the state, so it checks the status of the blades and hole wheels compression. If it passes, it shall be secured and pushed to sandblasting. The next step is the dismantling of the shaft. After removing the shaft, a removable O-ring, which is located on the shaft. Only after this operation, it is possible to assess the technical condition of the shaft, and sometimes even after sanding. On the vise is we have the same root. So we begin dismantling the plate, which is usually attached 4 screws. After removing them, gently separate the plate from the core. With the spreader plate is removed from the sealing ring, followed by assessment of the technical plate. At this point it comes to oil leaks on the inlet side, so if there is any trace on the surface of the hole in the plate, it is replaced. All gaskets are installed o-ring and thrust bearing, the second spreader, retaining pin bushing bearing shaft and at the end of the said bush. These parts are not assessed, because all except for the retaining pin are always replaced with new ones. All the elements, which are suitable for reuse are adequately protected from sandblasting. Sand can damage the components which are suitable for reuse. But before everything goes to sandblasters, the elements must be free from contamination from oil, grease, etc. Therefore, everything goes to the high pressure washer TURBO clean, where everything is very carefully washed and dried. – Now comes the division of the elements of these (body, exhaust plate under variable geometry, fixing vacuum valve), which will be transferred to the sand with corundum (high abrasion) and the (vacuum valve, screw, variable geometry, roller, wheel compression core , body intake), which will go to the sand with glass beads (precise cleaning and broadcasting gloss). Items that have been sandblasted with corundum, of course, will go to the sand with glass beads. – All sandblasted surfaces are thoroughly purged and then collected in a container along with the order, all transferred to the clean room. Clean room: Here are submitted turbochargers and performed adjustment variable geometry. All components of the sandblasting are re-assessed for even the smallest damage. Often fact that after blasting some cracks are visible body, or scratches on the shaft. At this stage, in the order they are entered parts to replace. Further, all the elements are cleaned with the pressure washer in order to remove the last traces of sand. Then, elements such as: core and variable geometry, go to the ultrasonic cleaners. After washing all the components, the employee takes roller to clean the room next door, where there are professional machines Schenck. Balancing is to reduce a weight imbalance that is at a certain angle. It affects the durability of the turbocharger. True, the new rollers are balanced by the manufacturer, but their tolerances are much higher than those established by our company. In practice, therefore, we balancing and weighing in with a much lower tolerances, resulting in improvement of the factory! At low speed balancer TB Comfort is positioned shaft of the turbocharger. Measurements are taken away each field correction, distance support, and all the data are entered into the machine. The data are checked, cleaned and lubricated prism; it checks the belt tension, sets the sensor and then performs a test run up. If there will be no complications, the measurement is unbalance, which will indicate places where you should reduce the weight imbalance. The same correction of unbalance, performed after the machine using specialized for this purpose, pneumatic grinders, sanding field correction (from both sides of the rotor), and previously selected marker. After the correction, the shaft is returned to the balancing machine and re-measurement is performed and in the same manner to correct the imbalance. So we reduce the imbalance, the order of less than 1 mg and thus the weight of a human hair. When the shaft is balanced is carried into the room door which are mounted two spreaders (new) and the compression ring, twisted nut with a force of 4.5 Nm. Compression wheel shaft returns to TB Comfort, but now the second rotor is balanced, and thus the compression wheel. Change settings on the machine and be made new measurements of the distance of the supports. Once everything is set, the test is carried out and the same unbalance correction is the same, only on the wheel compression, so using pneumatic grinder. To measure every time as accurate as possible, piles supporting the shaft are always clean and lubricated. Overall, the entire device must be very sterile, because the room is clean, air conditioned, and employees use gloves. >> So complex core then goes into the room with machines for dowa?ark? Schenck TB Sonio. Checkweighing is to eliminate the unbalance of the masses that occur at high speeds turbochargers (for normal operation of the turbine). The same correction is carried out in the same way by grinding, except that in this case the ground wheel nut is compressed. Run machine Schenck TB Sonio, so that the oil can be heated to the desired temperature (approx. 50 ? C). As the machine accelerates the impeller by means of the belt, as the balancer, but using a stream of compressed air, the air supply is needed. For this purpose, the machine is connected to a special cable that can withstand very high compression pressures. With the machine, there is a small blue valve and large. We start from loosening small blue valve to equalize pressure in the hose and the machine. Only then we can unscrew the large valve. Open the cover, and then we move magnetic sensor. Since each model turbocharger has different dimensions of the core, special adapters are needed to ensure solid fixing to the core of the machine and accordingly strong air flow into the impeller. Therefore, if we make such a turbocharger. KP35, KP35 to use the adapter. The adapter is attached to the 6 screws in the machine, which must be tightly curled. We attach the core of a turbocharger to the adapter very hard to avoid to break out of the core during the test. To the turbocharger is mounted a tapping oil supply and drain line to the oil tank in the machine. 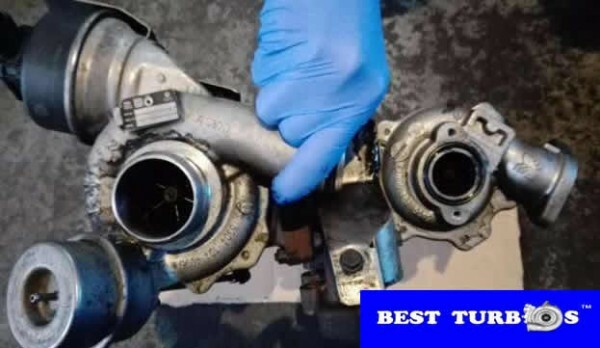 Next, check all connections, and then perform a test transfer oil through the core of the turbocharger. 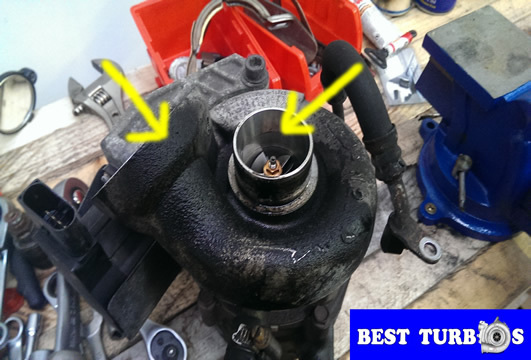 Oil from the core of the turbocharger must be free to return to the fuel tank – otherwise again dismantle the core. If the oil temperature is at a preset level, we run the program for the type of core. Programs are created under each model core. It means that we can not KP35 allows to add to the program, eg. GT17. After loading the program, we demagnetise and magnetizes the compression wheel magnet to the sensor can work properly. Very carefully set the magnetic sensor at a distance of 0.5 – 1.0 mm from the tip of the shaft. We set the stop, blocking the sensor bar cover on the wheel compression and sensor, and leave the cover of the machine. Now I run the trial start, paying particular attention to the oil pressure, air pressure, oil temperature and speed. If all the parameters are correct, we can start the test properly. Test correct a run-rotating assembly to its limit speed. For small turbochargers it is approx. 180-220 thousand. rpm, and the larger of 110 – 150 thousand. rpm. We run the test properly, by integrating the flow of oil, and a slow but steady motion, move the lever to the air supply to its maximum position. The machine itself cuts off the air supply after exceeding the permissible speed. After stopping the rotating assembly, the machine in the same way as the balancer, shows us the angle at which there is the largest mass unbalance – and so the place for correction. We raise the cover and the cover we move the magnetic sensor. Set the rotor by hand in such a position by which asks us to machine. Corrected point is always upright from the top. Once you have set the rotor, we move a magnetic sensor, grab grinder and grind carefully nut. The next step is to blow on the rotor and the nut to remove the chips. The magnetic sensor carefully move in the direction of the rotor, until the stop, the cover on the sensor bar and the main machine guard leave. The tests are repeated until the unbalance values below tolerance. Once we correctly allows to add a rotating unit print a special protocol with checkweighing, which contained all the information on. Running checkweighing and the final result. The core dismantle the machine TB Sonio and transfer to a clean room where the turbocharger is complex. 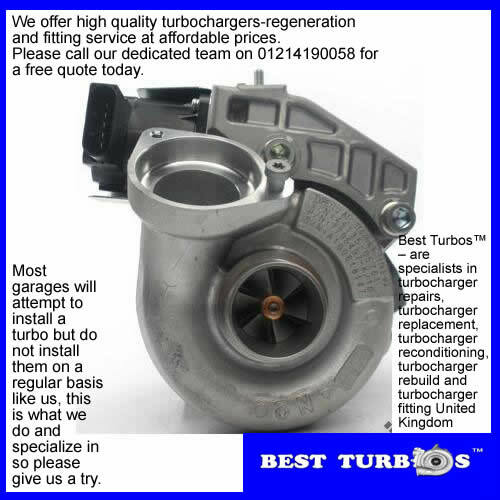 The turbocharger must be made in a very sterile conditions by a trained person. On the table is distributed paper that protect components against micro-scratches from the table. Elements such as sleeve bearing shaft, the retaining pin, manure, seal rings and thrust bearing. On the vise screw is the core of the turbocharger. The first thing we will do is mounting body intake. But before we proceed to this, attach the gasket to the plate. Housing Intake turn the screws and then disassembled turbo vice and screw in her vice versa (exhaust side up). At this point, folding turbochargers may vary due to the types of turbochargers. Turbocharger equipped with only a release valve just turn exhaust the body and proceed to regulate the valve. While the case is otherwise in the case of turbines with variable geometry. The body is inserted into the exhaust plate at the variable for three spacers, and variable geometry. The whole turn 3 screws firmly. Now we put a ring regulating blades of variable geometry, and him spacers and bolts. Make sure the variable geometry working without any resistance and in full. Now we make the body of the exhaust turbocharger core. Just like when making the body intake, so now also draw attention to the point that you pointed out and set it on the supply of oil. We use sealing paste on a combination of these elements. Now we turn the screws very hard from all sides. We install vacuum valve to the body inlet and then secure the lever cotter pin. So ready turbocharger waiting for adjusting variable geometry / relief valve.